Europe's largest port—threatened by rising waters and a loss of its major industry has reinvented itself as a playground for innovative thinkers who are trying to create a resilient city of the future. When Helly Scholten makes dinner, if she needs a tomato or squash or an onion, she heads upstairs; the top floor of her house is a 440-square-foot indoor vegetable garden. She starts cooking before the sun goes down, while warmth is still flooding through the glass walls of the kitchen downstairs. The entire home is wrapped in a greenhouse. 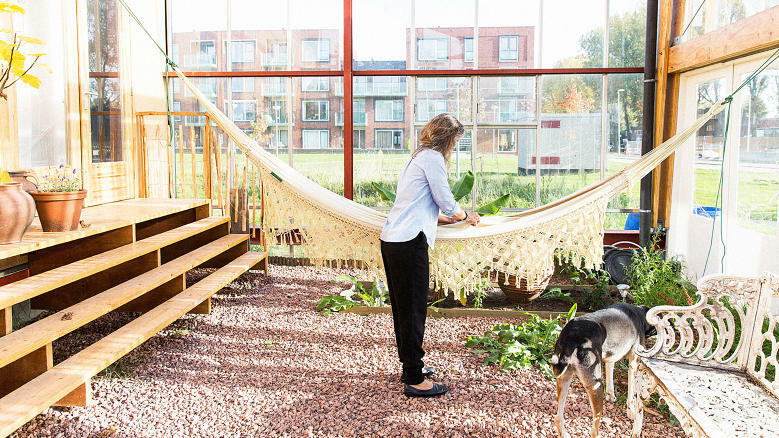 Sitting on the edge of the Port of Rotterdam, Europe's largest port, with a view of massive cranes out a kitchen window, the house is part of an experiment called Concept House Village, created to push the limits of sustainable design. Down the street, in the middle of a mostly empty field, another house tests features like an energy-producing toilet that harvests phosphate from pee. Another house, built from renewable materials, is designed to be constructed in a day. Read the complete (long read) article on www.fastcoexist.com.